Special Containment Procedures: SCP-1653 is to be kept inside a locked metal case unsheathed in Reliquary Storage Sector-23. SCP-1653-1 is to be kept in a separate case to avoid SCP-1653 from being sheathed. Under no circumstances is SCP-1653 to be placed in SCP-1653-1 and removed. Daily inspections should be conducted by first checking to see if the lock on SCP-1653's metal case is in good condition, the lock is in good condition, and that SCP-1653 is held within, same should be carried out for SCP-1653-1. If SCP-1653 and SCP-1653-1 are together, continue inspection as if they aren't. Description: SCP-1653 is a one-handed blade of Nordic origin dating back to ███ A.D. Its handle is 17 cm long and made of pure, solid 24K gold1. Its blade is a 74 cm long and 5 cm wide iron blade, though the sheen of the blade denotes any metal other than iron. All together, SCP-1653 is 7 cm wide, 90 cm long, and weighs 2 kg. The intricate design and overall quality of the blade does not apply to any known bladesmith of the time or in any historical records. The scabbard is referred to as SCP-1653-1 and its size is relative to that of SCP-1653. SCP-1653-1, however, does not factor into SCP-1653's effects as any sheath will work in triggering SCP-1653's anomalous properties (see Test 1653-DE-4); it is designated SCP-1653-1 based on its relation to SCP-1653. SCP-1653-1 does match the craftsmanship of █████ the █████████, revealing SCP-1653-1 was made separately of SCP-1653. There is an inscription on SCP-1653-1 in Swedish Short-Twig runes translating to "Tyrfing", the name of a sword in Viking legend. 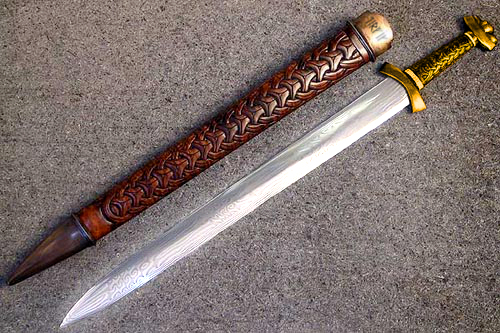 SCP-1653 is in remarkable quality for a sword of its age. Usual Viking forged armor and weapons have degraded beyond practical use while SCP-1653 is in pristine condition. Close inspection has shown that SCP-1653 has no trace of rust or refurbishing. Durability Testing has revealed that SCP-1653 is incapable of rusting and being unbreakable. Another anomalous quality of SCP-1653's material is a glow emitting from the blade that is similar to the glow of an open flame. This effect is caused by SCP-1653's blade taking light and reflecting it back at 150% the amount it received. This effect can be seen even in pitch darkness. It has also shown the capabilities to shear any known material with relative ease (see 1653-CE Tests). Testing of SCP-1653's effects has shown that those unsheathing SCP-1653 kill someone or the wielder himself by mistake or purposefully and are unable to sheathe the weapon without a human dying by SCP-1653 (see Test 1653-DE-1 - -4). Regardless the distance, how many targets there are, or anything to hinder its way to the target, SCP-1653 will strike where its wielder wills it to (see 1653-WE Tests). However, killing a human when unsheathed takes precedence over the will of its owner and kills them (see Test 1653-DE-3 and -5). Any wound made by SCP-1653 will end in blood loss or organ failure if the wound is severe enough (see Test 1653-DE-5). Tests have concluded that SCP-1653 is not sentient in any way. Acquisition: SCP-1653 was originally discovered by two grave robbers scavenging in the grave of King ██████ ███████████ at █████ Abbey in Sweden on 5/31/19██. One was subsequently killed by SCP-1653 and the other was caught by local law enforcement (see Interview 1653-GR2 Transcript), Foundation operatives within reported nothing abnormal at that time. Upon retrieval of SCP-1653, police deemed it of historical significance and delivered it to the ██████████ Museum. Foundation personnel did not retrieve SCP-1653 until the curator of stated museum was found dead the following morning of receiving SCP-1653. Class-B Amnesiacs were administered to all non-Foundation persons involved and Class-A given to grave robber after interview with false memories implanted. Incident 1653-ARKAD 6/1/19██: Agent R███ and Agent D████ were tasked to retrieve SCP-1653. After arriving and handling SCP-1653, Agent R███ placed SCP-1653 into SCP-1653-1 and removed it. Agent R███ [REDACTED], beheading Agent D████. Agent R███ was demoted to D-class and [DATA EXPUNGED]. Foreword: ███████ Olsson was the second grave robber who unburied the grave containing SCP-1653. After Incident 1653-ARKAD, Olsson was called in for a recounting of the events that transpired during the discovery of SCP-1653. Dr. Clarin: Do you know why you're here? Olsson: It's about what happened at the Abbey, isn't it? Dr. Clarin: Yes, what exactly happened? Olsson: Well, my buddy was tight on money and he [REDACTED]. So, he suggested we go grave robbing. I was against it, but I couldn't let him do it alone. Dr. Clarin: What made you choose a nunnery? Dr. Clarin: Are you alright, Mr. Olsson? Olsson: Yeah… I just… just… need to pull myself together. Dr. Clarin: What happened next? Dr. Clarin: Mr. Olsson, get a hold of yourself! Dr. Clarin: Now, please, continue. Dr. Clarin: That'll be all. Thank you for your time. Closing Statement: This interview has given us some insight as to how SCP-1653's anomalous effects work. Further testing is still required in order to measure the extent and validity of these effects. Olsson was sent home with Class-A Amnesiacs administered and false memories of his deceased friend implanted. Order for testing placed. Addendum 1653-1 - 6/4/19██: Testing approved by O5-Command. Procedure: D-3226 was instructed to draw SCP-1653 from SCP-1653-1 and kill D-2871. D-3226 complied, D-2871 did not. Results: D-2871 attempted to escape but tripped over himself. D-3226 struck once and killed D-2871. D-3226 suffered no ill effects. D-2871 died normal deathHE BRINGETH THE BELL OF DEATH'S GOD of blood loss and internal damage. Analysis: No anomalous effects to the attacked or the attacker. Procedure: D-3226 was ordered to unsheathe SCP-1653 and not to kill D-4932. Both D-3226 and D-4932 complied. Results: D-3226 was successful in drawing SCP-1653. However, the blade slipped out of his hands and D-3226 fumbled to catch it. The pommel of the hilt rebounded off his hand and SCP-1653 impaled D-4932 in the throat. D-4932 died of blood loss. Analysis: Inconclusive; further testing required. Procedure: D-3226 was given a target dummy and told to attack the dummy. Results: D-3226 missed the target and cleanly amputated his own left leg. Medical personnel were unable to stop the bleeding. D-3226 dies of blood loss. Analysis: Drawing of SCP-1653 from SCP-1653-1 creates an event where at least one person dies. Procedure: D-2385 was instructed to unsheathe SCP-1653 from the leather sheath and not to kill D-5123. Both D-5123 and D-2385 complied. Results: After five minutes, D-2385 grew tired of holding SCP-1653 and decided to put it back in the leather sheath. D-2385 continuously missed the mouth of the leather sheath. Infuriated at his failures, D-2385 threw SCP-1653 to the floor. SCP-1653 deflected off the floor and impaled D-5123 in the mid abdomen. Medical personnel were unable to treat D-5123's wound and D-5123 died of blood loss. Analysis: SCP-1653 cannot be sheathed without killing another person. SCP-1653-1 or any scabbard has no effect without SCP-1653. Procedure: D-2385 was told to draw SCP-1653 and kill the White Test-Lab Rabbit. D-2385 hesitantly complied. Results: The White Test-Lab Rabbit was placed on the metal table. D-2385 drew SCP-1653 and attacked the rabbit with a vertical strike. The rabbit moved away from the strike area. SCP-1653 sliced through the metal table and D-2385's foot. Medical personnel, again, did not save D-2385 despite the wound being of low severity. D-2385 died of blood loss. Analysis: SCP-1653 killing effect upon drawing only applies to humans2. No matter how severe the wound is blood loss is usually the cause of deathIT SHALL RING IN THE ENDER'S ARRIVAL. Procedure: Dr. Clarin controlled the T-198 Robotic Arm via remote controls behind bullet-proof glass. Dr. Clarin operated the arm to unsheathe SCP-1653 within a safe enclosure. Results: T-198 Robotic Arm was successful in unsheathing SCP-1653 before its internal components malfunctioned, sending it into a spiral. SCP-1653 slipped through its grip and pierced through the bullet-proof glass, impaling Dr. Clarin's research assistant, A███, who was closest to the glass. Medical team was not dispatched based on prior testing, janitorial staff was called instead. A███ died of blood loss. Inspection of the machine revealed faulty wiring to be the cause. Analysis: SCP-1653 appears to target those within reach of the wielder. Procedure: D-1345 was instructed to pick up SCP-1653 and not to kill D-5031. Both D-1345 and D-5031 reluctantly complied. Results: D-1345 held SCP-1653 for ten minutes then placed it back on to the metal table. Nothing else happened. Subjects were not killed. Analysis: SCP-1653's killing effect only happens when it is drawn from a scabbard or SCP-1653-1. Addendum 1653-2 6/11/19██: Further testing is to be carried out without SCP-1653 in SCP-1653-1 or any scabbard of any kind. Results: Clean cut through paper. Results: Clean cut through wood. Results: Clean cut through Kevlar Vest. Results: Clean cut through Solid Block of Marble Rock. Results: Clean cut through Titanium-Alloy. 1653-CE-Addendum: D-1345, who wielded SCP-1653 in these tests, stated that cutting the materials was "like cutting through clothes". 1653-WE-Addendum: The following tests were conducted following the legend of "Tyrfing", wherein the blade had the ability to never miss a strike. So far, all tests have proven that SCP-1653 is the sword of the legend. This was the final test. Procedure: D-1345 was instructed to strike dummy with SCP-1653. D-1345 complied. Results: D-1345 was able to strike dummy without any casualties. Procedure: D-1345 was instructed to attack the target five(5) meters away with SCP-1653. D-1345 complied. Results: D-1345 swung SCP-1653 in the direction towards the dummy. SCP-1653 slipped out of D-1345's hand mid-swing and pierced lower abdomen of the crash dummy. Analysis: Not only does SCP-1653 create an event that kills someone upon drawing but does so at the will of the wielder to attack the target. Procedure: D-1345 was instructed to strike the three dummies in one move with SCP-1653. D-1345 complied. Results: D-1345 held SCP-1653 over his head for the swing. Before D-1345 could swing, SCP-1653 slipped his grip and fell through the testing floor into SCP-████'s containment area. SCP-1653 entered SCP-████ and three copies of SCP-1653 appeared above the testing area. The three copies stabbed all three dummies. Two disappeared, leaving the original in the middle dummy. Damage to the floor was repaired. Analysis: Further proves previous analysis. Addendum 1653-3 6/15/19██: Based on testing, SCP-1653 has been approved by O5-Command for weaponization so long as it isn't sheathed. Incident 1653-1345DS75 6/15/19██: D-1345, who wielded SCP-1653 during testing, attempted to escape termination at the end of the month by using SCP-1653 at the end of the 1653-WE Tests. D-1345 threw SCP-1653 with the intent to kill everyone within the facility. SCP-1653 pierced through the testing enclosure and proceeded to rebound and deflect off various places within the facility, wounding several personnel in its path and damaging multiple essential systems and devices. All facility doors malfunctioned and locked personnel within the facility. Containment Breach alarm triggered. All personnel outside the facility were evacuated to a safe distance. SCP-1653 managed to detonate Site 75's on-site warhead, destroying multiple SCPs and killing all personnel within the blast radius, including D-1345. SCP-1653 was found later embedded into a rock 56 km from Site 75's ruins completely intact. A precise replica of SCP-1653-1 was produced and contained with SCP-1653 in Site 68's Reliquary Storage Sector-23. 1. The amount of purity, craftsmanship, and usefulness in combat could not be accomplished by normal means with this material. 2. Further testing is required to find out if this extends to intelligent beings besides humans. No such form of testing exists at this time.